I'll admit it, I'm a lazy, lazy girl. I'm terrible at beauty regimes. How do all the lovelies find time to keep their nails chip free, skin fresh and make up on point 24/7? I can barely find time once a fortnight to touch up my hair colour. 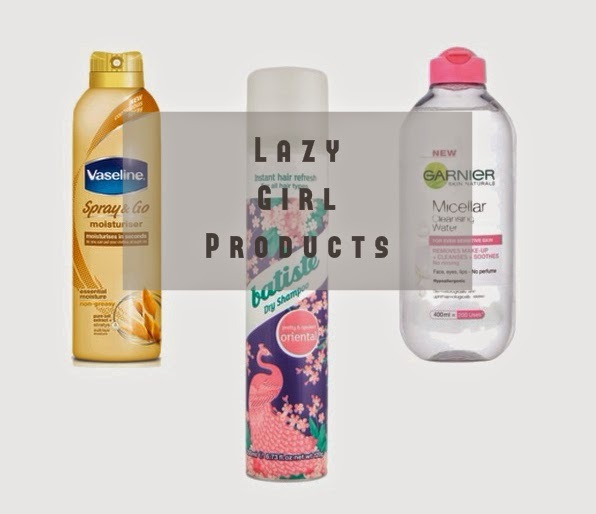 With that in mind, I thought I'd share my top "Lazy Girl" products. I think most of us know now how awesome dry shampoo is for adding volume and sprucing up tired hair. I honestly have the flattest hair ever and when I was a young'un, I used to wash my hair each day. Since I died my hair red over 7 years ago, I've had to retrain my hair to last a few extra days between washes, otherwise I would be topping up my haircolour every week....and as I said, who has time for that shizz? I've tried many different brands of dry shampoo, with a surprisingly high fluctuating price difference too. From £1 bargains to £11 for a higher end high street brand and I still go back to what seems to be the most popular brand in the UK; Batiste. This stuff is just great for my bright red locks, it means I can make a wash last 2 or even 3 days and that in my opinion makes it a saviour. Plus, it comes in a gazillion different smells. Sweet. I know, I'm late to the party but this stuff really does live up to the hype, doesn't it?! When I get home from work, the first thing I want to do is get rid of my make up. I wear quiet heavy Estée Lauder foundation so it's nice to get it all off as soon as I get in the door and then it feels like I can relax, let my skin breathe and let it all hang out, so to speak. This Garnier one is the first Micellar Water I've tried and to be honest, I can't see me switching away from it any time soon. It always seems to be on offer in either Superdrug or Boots too, bonus! In the past it's been rare for me to get all my foundation off without a cleanser and a wash but this stuff does the job and makes my face feel super fresh in the process. +10 Lazy girl points. Seriously, who has the time to full body moisturise? When I get out of the shower, I want to get my clothes on quickly, especially the past few months when the temperature in my dressing room has been lower than outside (we've been decorating). I certainly don't want to spend 10/15 minutes applying a layer of slip n slide-esque coating and wandering around the house like a penguin. I want to get warm and cosy. So when I picked up this Vaseline Spray & Go on sale in Superdrug on a whim I wasn't convinced I would actually use it. (Do you do that too? buy stuff you're not sure you'll actually use?) But I did!! And I still do. A wee spray after my shower, a quick run over with my hands and I'm good to go. Puuurfect. I'm also loving the slight coco-butter/ vanilla scent on my skin too. I'm sure you've probably tried at least 2 of these products but do you have any other lazy girl product suggestions? I LOVE lazy girl products, dry shampoo is my absolute go to - it takes so long to dry my hair that I hate washing it more often than necessary! In lazy terms, I have been known to use face wipes when I've stumbled in drunk and fallen into bed - not great, but better than not taking makeup off at all, right? I need to buy some more micellar water, I've ran out and it's actually the bane of my life taking my makeup off when it's late! I can't think of any other lazy girl products off the top of my head to be honest! I love the products you chose out as I go through the same problem everyday!